Day 222: If you own a Mercedes Benz, I would suggest that you have Made It. This is a car that says, "Hey, I have made or inherited money, and I deserve the finest things in life." I think that these are beautiful cars, and hope to have one myself someday. It's a comfy car. I do NOT, however, think that if I have one, I will drive it like a maniac through the rush-hour traffic, trying and failing to beat the light, and nearly kill innocent, attractive, artistically-inclined math majors. If you are the owner of the white Mercedes Benz that was trying to do that to me earlier today, I submit that you should just calm the heck down, and take your foot off the gas. Why do you care about being stuck in traffic? You're stuck in traffic in a MERCEDES, lady! In other, less near-death-related news, I have decided to start including swimming in my workout routine, which I've long considered (as we'll see, below). The gym has an outdoor pool, and I have a lovely swim this afternoon (ahem... apologies to my Vermont peeps. You'll be able to swim soon, I promise! It's only, like, three more months until spring!). I do seem to have a problem with my speed controls, though: I swim like I'm in a Jaws movie and can hear the music that means one of the people onscreen is going to meet the shark. I have friends who swim very, very, very fast. I do not swim as fast as them; I do not swim "competitively" fast. That's not what I'm saying. What I am saying is that I swim as fast as I can. My accelerator has only one speed, and I need to figure that out. Now, when I'm running, I take it very, very, very easy, and only sprint at the very end, which is a wise policy. When I was swimming earlier today, the gentleman who was sharing my lane observed that I had a pretty good sprint speed (I kept passing him, which was a little socially awkward, but we worked it out). That said, I was also nearly dead after 1/8 of a mile, because... well, because I was going really fast. There MUST be some secret to adjusting my swim pace, and I'm sure I'll figure it out. It's weird that I seem to be hard-wired to go as fast as possible, though. If you have any swimming tips, particularly for distance, please let me know! - 1.5 mile run in 9 minutes, wearing boots and pants (max 11:30) -- After two months of actual boot camp, I was able to do this in 10 minutes flat... when I was 20. Ahem. Now, this is ambitious. Heck, it's ambitious for 20-year-olds; remember, this is the test to get into the Navy Special Forces school! I had been hoping to be in shape for it in time for my upcoming birthday, but that's in two short weeks, so... no. However, I do think it's achievable by July, as long as I'm not killed by Mercedes-Benz-driving lunatics between now and then. What are YOU doing to stay in shape? What are your goals? Feel free to comment, give advice, and share in the spirit of achieving the impossible! We're all riding this existence together, and we should always, every day, push to be awesome. If that's working on a digital painting, creating your own fantastical world, or investigating the real world we all share, do something awesome and challenging every day. Let me take a penguin moment to shout-out to my bro, R. He has stuck with his low-carb diet, has been to the gym 27 times this month (!! ), and has observably changed the way he looks. AND he forces me to go to the gym when I don't want to, which is why he's my bro. So go do something amazing. Do something you think you can't do. You will surprise yourself. YOU WILL NOT GET TODAY BACK, SO MAKE IT COUNT!! Day 220: Oh, my penguinians, how I have missed you so! I've been very, very, very ill, and haven't been updating, but now we're back in the swing of things, and I thought I'd catch you up on our adventures! You can find the full-sized painting here. R has been pushing me to do more with color, and this is a cautious step in that direction. 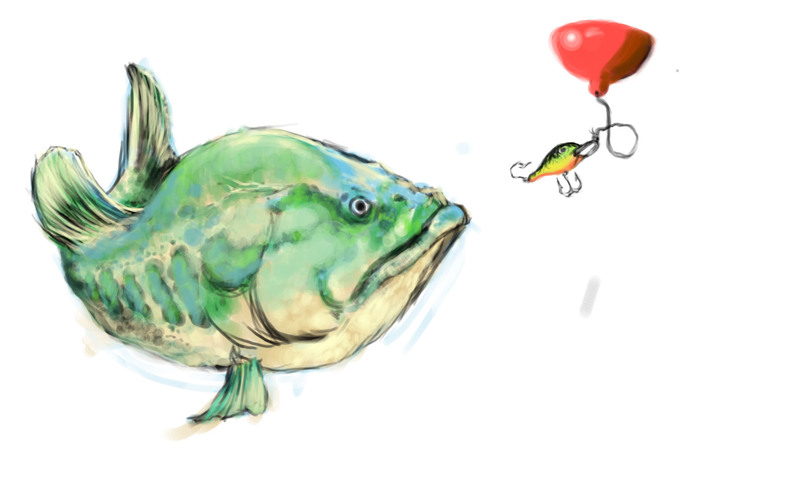 That bass-ish thing is not really colored the way a bass is, but he's mostly anatomically correct, and I had fun doing the mottled colors and highlights. I started with a base of color, then did the blackline sketch over that, then did the highlights and accents over that. It was a lot of fun, and I'm learning more and more what I can do with this whole digital painting thing. It's a very strange feeling to see an idea pop out of my head and onto the actual digital canvas; the process is MUCH faster than traditional painting, and it's a lot easier to clean up mistakes, or even to scratch a bad idea and start over from scratch. This past weekend R and I journeyed up to see "Hansel and Gretl", which is the worst movie I'm allowed to see this year. ("Movie 43" is right out). Jeremy Renner does his level best, but it's just a bad movie, with not much in the way of plot that is interesting. Cool special effects, though now that I've spent some time studying the actual technology and art behind special effects, I find that I spend most of my time thinking through how I would do the effect myself rather than enjoying the spectacle of it. I keep saying that a fun weekend project would be to recreate all of the effects of "Chronicle", just to prove to myself that I could do it. In point of fact, G of E&G fame is also interested in this stuff, and, you know, having two people focused on the task can only help! Tonight, E&G, MH, R, and CJ and my noble self placed third, or possibly fifth, at trivia! In any event, we won some nice little glasses, and were able to correctly identify such diverse entities as famous hockey players, the color of Monica Lewinski's infamous dress, and the Frenchman for whom the unit of electrical charge is named. In the last instance, MH noted that I was simply FURIOUS when they revealed that the "unit of charge" question was going to be simplified to be multiple choice, but I was happy that, even so, most people thought it was Ampere or Joule. Oh, how we laughed. I've neglected nearly ALL OF YOU over the holidays, so let me take this moment to say that I hope you are all well and happy, and have an absolutely wonderful new year! I'll post pics of the New Years Eve madness shortly. Oh! Also, the Official Birthday Scavenger Hunt is coming up, on Feb 8-10. This is mostly you taking pictures of yourselves and sending them to me, but, you know, near a tiger, or whatever. We're still working to recover LAST year's pictures from a hard drive which is currently missing a power supply, but I WILL get those up before the 2013 Hunt begins!! I'll keep posting up images, and relating our adventures, and do please feel free to comment! I did discover the best thing to do to salmon. Put the filet into a small bowl with a mixture of the garlic and chili sauce, garlic powder, and soy sauce. Marinate for one hour in the fridge. Line a baking sheet with heavy duty aluminum foil. Preheat the oven to 350 degrees. Put the filet on the foil. Heat up the butter/lemon juice/honey in a saucepan or microwave (2 minutes on the stove, until the butter is melted, or 35 seconds in microwave). Pour HALF of the honey-lemon-butter sauce over the fish, and place in the oven for 20 minutes. Remove the fish from the oven, and cover with the over half of the sauce. Crank up the broiler in the oven to a full whack, and put the fish with the glaze under it for 7 minutes. The honey carmelizes and crunches up deliciously! Day 203: Life is about adventure, but there is no guidebook. I, like you, wish that there was, and we all lament that there is no resource to which we can turn, when, say, a girl smiles at you a certain way. What should you do? My prescription is audacity, though that does not work for everyone. Merry Christmas, and may the coming year find you happy and prosperous. Now, that's quite a nice sentiment. The tome in question is one of the seminal works on camping in the United States at the turn of the century, originally published in 1906. The edition Chris gave me was from 1927, which split the work into two volumes: Camping and Woodcraft. Camping is about what we, today, would refer to as "car camping", or what Kephart refers to as "wagon camping". How to outfit a long-term camp, and how to camp when you have all the resources of a nearby wagon. However, I did not have access to the second volume, "Woodcraft", until today. As a Christmas present to myself, I now proudly also own a 1917 edition of Woodcraft, which is what we would today call "backpack camping". They are, collectively, an extraordinary read. My copy of Woodcraft was apparently at one point a part of the Michigan State Library system. It was checked out on Sept 4, 1923; May 15, 1924; Aug 23, 1924; and Oct 1, 1924. And now it's in my hands, which makes me the luckiest person in the world since Oct 1, 1924. It is, quite frankly, a true guide to adventure. Day 200: Wow. Time flies when you're having California, amirite?? 200 days of pure adventure! Today's tale is one from the holidays, but, trust me, gentle reader, it's a good 'un. I got on the Hertz shuttle in Charlotte, and headed for my seat. As is my custom during the winter, I was wearing my Navy-issue peacoat (which, by the way, is about twice as heavy as one of those peacoats that hipsters buy at Sears or whatever ironic store they're ironically shopping at these days). According to the US Navy: The heavy topcoat worn in cold, miserable weather by seafaring men was once tailored from pilot cloth -- a heavy, coarse, stout kind of twilled blue cloth with the nap on one side. The cloth was sometimes called P-cloth for the initial letter of the word and the garment made from it was called a p-jacket -- later a pea coat. The term has been used since 1723 to denote coats made from that cloth. My Noble Self: Oh, no. Years ago. G: I recognized that Electronics Technician Third Class patch. Me: Yep! I was actually frocked to second class, but was discharged before changing over all of the patches and stuff. G: Where did you serve? Me: I was a nuclear reactor operator on subs out of Groton, CT. Did you serve? G: I still do, in fact. I'm also a submariner. Me: I do miss the order of it sometimes, but... I do NOT miss being underwater. (his wife laughs a little more, and says) He LOVES it. He misses it when he's home! Me: Well, I'm thankful that you're out there, sir. G: What do you do now? Me: I used the GI bill to get a degree in mathematics, and taught high school for a couple of years, and now I'm a computer consultant on a project out in California, though I may be heading to Hawaii at some point. G: Did you like teaching high school? Me: I did! I always talked up my service, because, as I told them over and over, it led directly to a college opportunity that vastly improved my life. A lot of my kids went into the service, and I like to think that I gave back a little bit. I look at the card, and then slowly look back up to see his wife laughing again, and his eyes twinkle a little in the corners. G: You just never know who you're going to meet on a rental car shuttle. I'm leaving out some of the more personal bits, but apparently his daughters go to school in SC, and he and the wife were visiting for the holidays. Truly, honestly, genuinely solid guy. I honestly couldn't help myself. Day 196: Happy 2013, penguinians! I have sooooo many holiday stories to relate, but first let me fill your ear with tech-savvy genius, courtesy of R.
Let's say you have a gmail account; something like, say, chainsawpenguinblog@gmail.com (that's the official email for this blog, by the way; can you BELIEVE that chainsawpenguin was already taken??). Now let's say that your fearless penguin decides that he wants to create an account at some website that requires an email address. He could, of course, just use his default address. However, he can also add "+" and some codeword, and it will still go to the original address! You literally can have an infinite number of gmail addresses, all going to the same mailbox. The great thing about doing this is that you can then filter incoming messages in gmail, and dump them into separate folders, all in one mailbox! ...it's possible that I'm a bit of a nerd. Okay, so I have loads and loads of cool adventures that were had over the holidays (yes, I did sit and watch 12 hours of Doctor Who on Boxing Day! River Song's episodes in River Song's order!! ), but I really must dash off to work, so I'll make this a quick one. I recently went (on New Year's Eve, in fact) with a couple of my favorite peeps to the Crocker Art Museum here in Sacramento, which is currently featuring an absolutely phenomenal Norman Rockwell exhibit. And that may be my favorite picture of me EVER! !